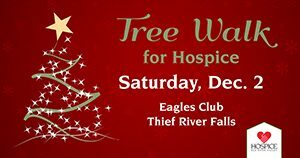 The 3rd Annual Eagles Tree Walk, held at the Eagles Club #2368 on Dec. 2, raised $2,970 for Hospice of the Red River Valley. The donation will be used to provide compassionate end-of-life care and support to those in Thief River Falls and the surrounding communities. “From everyone here at Hospice of the Red River Valley, a big thank you to Laurie Harger, the Tree Walk planning committee and, of course, the community of Thief River Falls and the surrounding area,” said Samantha Gust, development officer at Hospice of the Red River Valley. “The amount of support you provide is amazing, and it allows us to continue serving patients and their families when they need it most. We are very grateful.